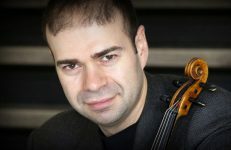 Few violinists are aware of the physics of a bowed string. Why is this? I never heard my teacher, Raphael Bronstein, or any of my other professors at the Manhattan School of Music, refer to Helmholtz motion as the perfect motion of a vibrating string, and that the ability to maintain this motion would make my violin sound its absolute best. How wonderful it would have been to see the Schelleng Diagram or hear a story of Professor Helmholtz observing the motion of a vibrating string for the very first time. Unfortunately, this conversation never took place and I was taught tone quality like the generations of violinists before me, through modeling. 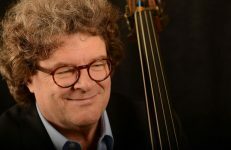 Why is it that more string players do not use the physics of a vibrating string to teach tone quality? I learned about the physics of the vibrating string only when I was writing my dissertation. As a public school strings teacher I have tuned many low-quality instruments before rehearsal. 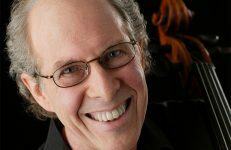 It is not unusual for me to see a huge smile appear on a child’s face while I am tuning an instrument, and hear, “Wow, I didn’t know my violin could sound that good!” The joy on their faces from knowing that their little violins really did sound good, gives them inspiration to work even harder. I knew then, that this was the topic I needed to research for my dissertation. I wanted to understand why the violin responded this well, and then learn how to teach it. This is when I learned about Helmholtz motion  and the Schelleng Diagram , along with much more scientific research on tone production, all of which I am eager to share with you. Imagery is a very powerful teaching tool for understanding and retaining new information. Professor John Schelleng provides us with a visual aid for good tone production – The Schelleng Diagram. Schelleng published his diagram in the article, “The Physics of the Bowed String,” published in The Physics of Music, in 1973. His diagram has since become the scientific model for showing how position of the bow (varying contact points) and motion of the string (varying bow pressure) relate to good sound production. Changing the pressure on the bow or where the bow travels on the string between the bridge and the fingerboard each have a dramatic influence on tone production. When choreographed together, the violin has the capability of producing spectacular dynamic variations. 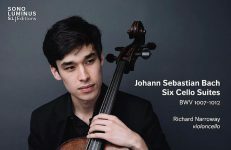 Understanding the physical response of a bowed string will enhance a musical performance by allowing us to play with the greatest variation in dynamics, while maintaining a good tone. When I first began research for my dissertation, I spent a lot of time reading and re-reading documents from the scientific world, to be able to process the information. Because this was difficult for me, I thought what might be of the greatest help is to simply tell you what the Schelleng Diagram tells us about tone production. The area between the two parallel lines represent the region where Helmholtz motion can be maintained, using the bow-bridge distance (contact point) and the downward force (pressure) on the string. 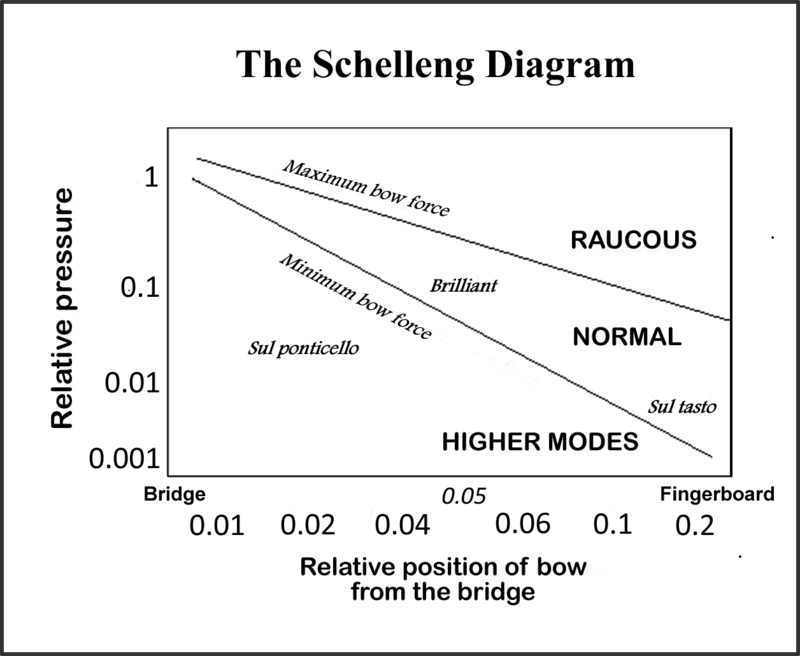 The numbers on the left side of the Schelleng Diagram illustrate the amount of bow pressure. The least amount of bow pressure is at the very bottom and proportionately increases as you move toward the very top of the diagram. The numbers along the very bottom of the diagram illustrate where the bow is placed on the string between the bridge and the fingerboard. The left side demonstrates bow placement on the string closest to the bridge and proportionately closer to the fingerboard as you move towards the right of the diagram. To best illustrate these two aspects of tone production, I have selected two videos for you to watch, featuring Henryk Szeryng and Midori both playing Tzigane by Ravel. Each violinist demonstrates a different but equally effective approach to tone production. Henryk utilizes more bow pressure than bow placement for good tone and musical color changes. His bow stays in the central area of the string (contact point 3) between the fingerboard and the bridge most of the time. Midori utilizes more bow placement (contact points 1 – 5) than bow pressure. Her musical color changes, and tone production is implemented flawlessly and effortlessly. Each gives a powerful performance of this dramatic piece. I look forward to your feedback and hope that some of my ideas will help you pull beautiful music out of your instrument. Helmholtz, Hermann von, (1862), On the Sensation of Tone as a Physiological Basis forthe Theory of Music, Tran. Alexander John Ellis, 4th ed. (New York: Longmans, Green, Doves, 1912), 71. John S. Schelleng, “The Physics of the Bowed String,” 69-77 in The Physics of Music, ed. by Carleen Hutchins (Scientific American, San Francisco: W. H. Freeman & Company, 1978), 75. Certainly the Schelleng diagram makes some points clear regarding the point-of-contact / pressure relationship and how different tonal qualities correspond to different places on the “map”. However, especially for the neophyte, I wonder if a diagram with linear, rather than exponential, axes might convey the points more clearly. On the violin, the five contact points referred to in the next article are equidistant. But if one marked those points on the bottom of the diagram, 1 and 2 would be far apart; 4 and 5 would be close together. A diagram with linear axes would show that the different in required pressure for Helmholz motion between points 4 and 5 is quite small, but the difference in required pressure between 1 and 2 is very large! But maybe a diagram with linear axes is not readily available. I certainly can understand why a mathematician would prefer exponential axes. Thank you for commenting on my article Terry. There is a short 8 page paper online (http://www.speech.kth.se/prod/publications/files/3140.pdf) written by Schoonderwaldt, Guettler, and Askenfelt titled “Schelleng in Retrospect.” Take a moment to look on pages 4 and 5 at the diagrams, and see if this is maybe easier to see. The Schelleng diagram in my article was drawn by me, modeled after Schelleng – however, you are correct that the contact points do not line up as they do on the instrument. I believe it may be because of the difference between the string tensions and thickness – although I am not a scientist. Contact point and bow pressure combinations to produce Helmholtz motion is not an exact art – horsehair texture, the amount of rosin applied to the bow, and even the bow itself has an influence on where along the string and the amount of pressure used, will vary its production. I do believe Schelleng represents the optimal placement and pressure in his diagram – but as you will see from reading the Schoonderwaldt, et al., paper, there is still much disagreement. Let me know your thoughts. Could you make a mention of using the edge of the hair for Harmonics which gives a purer sound than a full width bow hair contact? Strangely Henryk does not roll his bow over very much . I used to see him a lot at Promenade concerts in London . I tried the techniques mentioned and they really helped to improve my playing! Thanks for sharing! I am so glad that the exercises helped! When we sound good – we want to spend a lot more time on the instrument. So many teachers focus on the left hand – they forget that the right hand is the soul of our instrument. The more you develop your right hand – the greater progress you will hear, and the more satisfaction you will have playing your instrument. Thank you so much for letting me know that I was able to help! Cheri always offers incredible knowledge and information. I wish there was a version of her drawing these connections for pianists and organists as well! Just a few minor corrections and notes on John Schelleng. 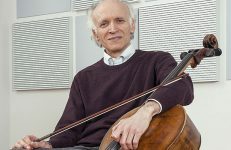 You referred to him as professor, when actually he was never a professor, but a respected researcher for Bell Laboratories, and an amateur cellist, who played seriously from age 6 to his death at 86. Also, his middle initial is ‘C’ for Christopher. He was my beloved grandfather and musical mentor. He and Carleen Hutchins were co-founders of the Catgut Acoustical Society.